It's here!!! My new phone arrived today. I got my first cell phone 8 years ago and I never replaced it for one reason or another, mostly because it still worked. The other reasons included the high cost of accessories, having to change my phone plan and well, why bother? But when my music player broke I decided that it would be easier to just get a new phone with a music player instead of buying a separate one. Then last week the phone froze up and they told me that once it does that it means it is dying. Well, 8 years was a very long time. The guy at the verizon store had never heard of a phone lasting so long. I think it deserves to go live in a museum or something. So, FedEx attempted to deliver my package yesterday. They called me wanting better directions. I asked them to deliver it to my workplace since they needed a signature anyway. It arrived this morning and I was excited. It is a nice looking phone with a keyboard inside. I must admit I spent a bit of time playing with it and reading the manual. 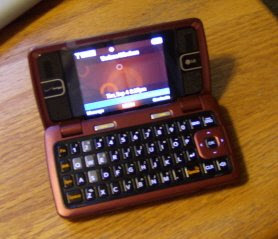 I sent my first text message. It is a momentous day! I didn't buy any accessories with the phone because I wasn't sure if the hands-free device that I have would work with it. It does! That's cool. I got that at the thrift store for $3. New ones cost $15 and up. I haven't figured out what I need to transfer photos from my phone to the computer yet. I definitely need a case. It doesn't even have a place to hook a leash on it. It's a little big to be in my pocket. I was disappointed with the music player. I'm not sure if there is a way to get the music from my computer on to the phone or not. I can buy songs off of the VCast site but they cost $2. Songs from Amazon.com only cost $1. I don't want to have to buy new songs for my phone especially if I already bought them for my computer. There must be a way. Probably some other accessory that I have to buy. Oh, and since when do I have to buy games for $8 each? Wow, I am behind the times. There are a ton of games to buy. I think I will buy one game. I'll put it on my want list and buy it before I go on my next plane trip so that I have something to do in the airport besides stare at people. I was hoping it would have free games like phones used to have (but my old phone didn't have them). I guess I missed the decade of phones with free games. Well that looks very spiffy. I do say when you decide to buy - buy the best you can get. 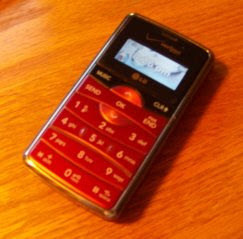 Yah, I wanted a phone that could do a lot of stuff even though I really only use it as a phone. Never know when I'm going to want to send a picture or something. Windshield photos should be on tomorrows post!